Linking to a video in Adobe Flash CS6 creates a dependency to an external file, but it allows your movie to stream the video progressively when needed without adding the extra weight of the video to your final movie. In a new or existing Flash document, choose File→Import→Import Video. The Import Video dialog box appears. The Import Video option isn’t available for documents whose publish target is set as HTML. 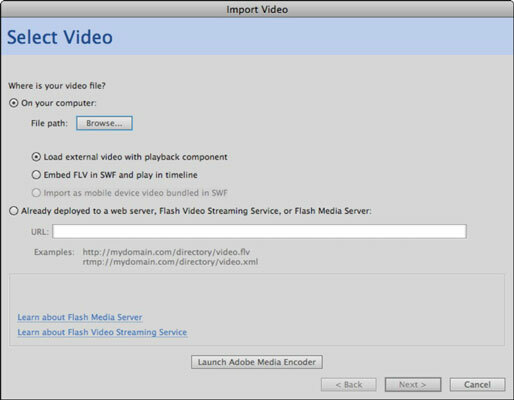 The Import Video dialog box gives you two ways to direct Flash to your video: On Your Computer and Already Deployed to a web Server. The first (On Your Computer) is the most common. It indicates you have local a file on your computer that you’d like to use. Leave the On Your Computer and the Load External Video with Playback Component radio buttons selected. Click the Browse button. Locate your video and click OK.
Click the Launch Adobe Media Encoder button at the bottom of the dialog box to launch the AME. 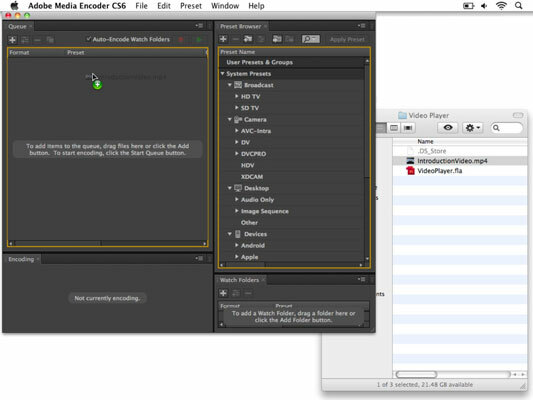 The Adobe Media Encoder application launches. On the left side of the window is the queue, where you’ll drag the videos you want to encode for Flash. 2On your local file system, locate the file you tried to import and drag it into the queue window. In the queue, the target file format and settings are listed under the video file. For now, leave the default, which should be F4V, Match Source Attributes (High Quality). Click the Start Queue button or simply press the Return/Enter key to start encoding the video. A chime should sound when encoding is successfully completed. Switch back to Flash CS6. The Import Video dialog box should still be open. If not, repeat Steps 1–3. Once again, click Browse and locate the newly encoded file, which should be in the same directory as the original. It will appear with a .f4v extension. Click OK/Open and then click Next at the bottom of the dialog box. Because this is a linked video file, your published movie will continue to look for the video in its original location and will fail if either the video file or movie is relocated. It’s recommended that you copy or move the encoded version of the file to the same directory where you intend on publishing your final movie. You’re viewing the Skinning screen, where you can customize a skin for the player that displays your video. From the Skin drop-down list, choose a skin that displays the style and type of controls you’d like to use. For example, the SkinUnderAllNoCaption option creates a toolbar that sits under the video window and features all common video playback controls except for the Closed Captioning option. From the Color picker, choose the color tint for your skin. 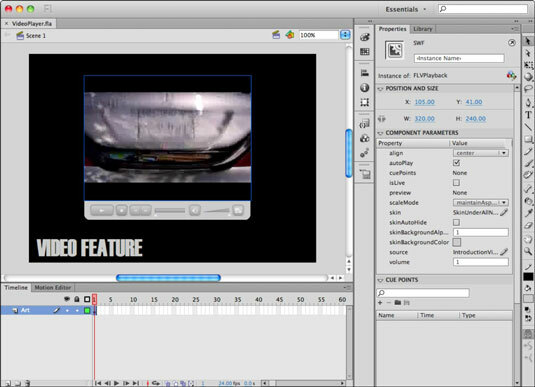 Click Next to complete the process and click Finish to close the Import Video dialog box. After a moment, the new video (and its player) is placed on the stage. Choose Control→Test Movie →In Flash Professional to preview your movie with the new video added.